When National Law Conflicts with International Human Rights Standards: Recommendations for Business – Insights from the evening. Report launch: When National Law Conflicts with International Human Rights Standards: Recommendations for Business – Insights from the evening. When the UN Guiding Principles on Business and Human Rights (UNGPs) were endorsed in a Human Rights Council resolution, the occasion was hailed as a rare moment of unanimity and solidarity in the human rights field. Although the UNGPs have since faced criticism from some quarters regarding their voluntary status, they are an excellent starting point for civil society and governments to engage business on their ethical records, and as guidance for businesses themselves on implementing human rights policy and due diligence. In contrast to the generally positive and universal reception afforded the UNGPs, the reality for businesses operating on the ground can be difficult, particularly when they are faced with the challenge of complying with domestic legislation when it conflicts with international human rights standards. The lack of respect for human rights in various countries around the world, and the gap between national law and international standards can be bleak. 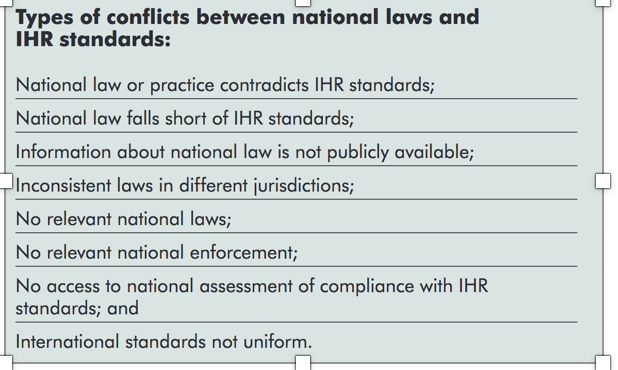 The launch of this report, When National Law Conflicts with International Human Rights Standards: Recommendations for Business, is a welcome contribution to the discussion on how to navigate these areas of contestation in practice. Presenting the findings of a year-long study, it explores examples of where tensions can arise between companies’ desire to adhere to their obligations under the UNGPs and the requirements or constraints of the legal and political contexts in which they operate. Most commonly, rights found to be compromised in these countries are the right to privacy, right to freedom of expression and the right to freedom from discrimination. The latter is especially problematic regarding employment of women, ethnic and religious minorities, and people with disabilities under regimes where these groups face systemic discrimination either through cultural practice or from domestic legislation. In these instances countries face a dilemma between upholding their own principles of non-discrimination, or breaking the law in these countries and putting employees at risk from abuse. An important takeaway from the evening was the importance of applying a human rights lens to business practices, rather than tacking human rights onto existing health and safety practices. This increases the likelihood of human rights due diligence practices being put in place, improves their effectiveness and sustainability, and makes it more likely that business practice will adhere to international standards. For example, this may include a designated in-house human rights policy officer, team or the employment of an external consultant. Two particularly useful sections of the report highlight the eight types of conflict the study identified and the different approaches companies can take to tackle them. internal measures such as limiting compliance to “a narrow interpretation of the relevant law, or compliance only under limited circumstances”, making local exemptions and centralising decisions at headquarters to take pressure off local employees. Approaches within the value chain of the company such as using codes of conduct to put leverage on suppliers to comply. External engagement approaches such as complying with local laws whilst also putting leverage on local stakeholders to effect policy change, engaging collaboratively through multi-stakeholder initiatives to push back against government pressure, and being transparent when national laws and international standards do conflict within their operations. Alternative responses included challenging domestic legislation through legal action or delaying compliance with local laws as far as possible. As an absolute last resort in the face of imminent and serious human rights violations, companies may also consider the possibility of withdrawing operations from that jurisdiction entirely. With elaboration on the UNGP standards needed, especially regarding the issues addressed by Guiding Principle 23, response to the report in the room was generally positive. As the number of transnational corporations joining the human rights cause increases, demand for guidance on resisting pressure where national law conflicts with international human rights standards also grows. The comprehensive and detailed nature of this report lends itself to practical application by companies, and may help to lay the ground work for further industry-specific guidance and best practice sharing. The report can be accessed on the BIICL website.